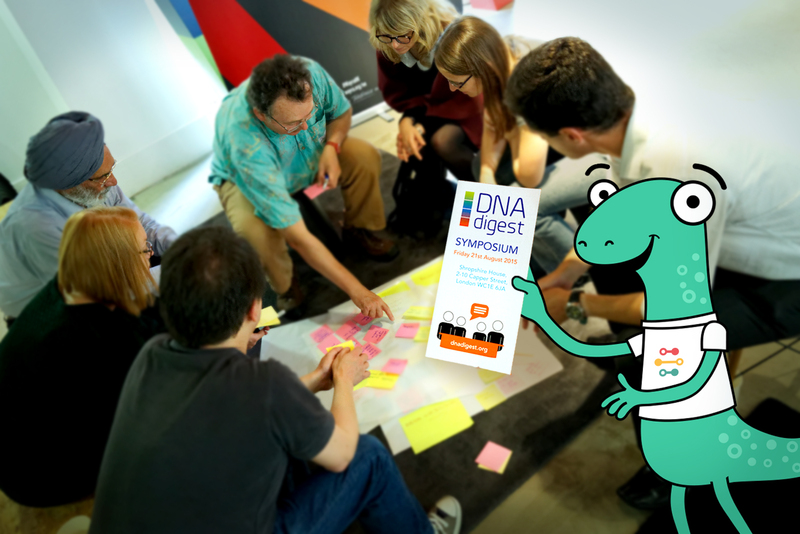 Last Friday, 21/08, Wayra hosted the DNAdigest symposium “Incentives for data sharing”. 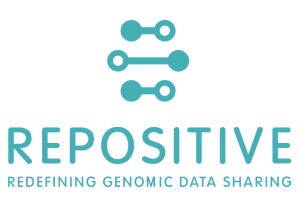 On a hot summer Friday in London, we asked the attendees: “How can we create incentives for data sharing in genomics research?” Despite the summer break, we had excellent speakers and a very engaged audience. Both attendees and speakers applauded the great quality of the discussions and the cosy atmosphere of the event. In the first part, Natalie Banner from the Wellcome Trust, Neil Walker from the University of Cambridge and Shahid Hanif from the Association of the British Pharmaceutical Industry presented multiple prospectives on data sharing. Natalie Banner made it clear that the objective of the Wellcome Trust as a funder is to maximise the benefits for health and society, and gaining the best possible impact of their funding for research. Best possible impact also means maximising data use and utility for reuse, which is why the EAGDA is investigating best practices for data sharing. Natalie’s presentation is available here. Neil Walker presented how funder policies can be difficult to implement for the individual researcher and shared many anecdotes on data sharing and how he uses data management plans to outline for funders how data will be stored and used. Neil’s presentation can be downloaded here. Shahid presented the perspective of the pharmaceutical industry which is working on many different fronts to engage with patients, academic researchers and clinicians to make the best use of available health data to design clinical trials and use existing data for drug discovery. Shahid’s presentation is here. 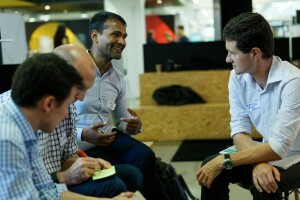 Open space discussion 1: What are the challenges and unsolved problems with data sharing? All attendees gathered in groups to identify main themes for the continuous challenges for data sharing in genomics. Notes from each discussion group are posted on the DNAdigest hackpad. 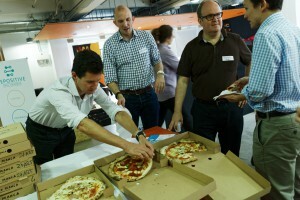 We interrupted the great discussions to have some excellent pizzas from Franco Manca. Yum yum! 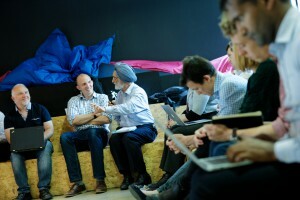 In the afternoon session, the focus was on tools and workflows. First Roland Roberts from the Public Library of Science, explained how PLoS was founded for the purpose of better knowledge sharing through Open Access publishing. He showed several examples of statistics on data sharing in different fields of science, showing there is a long way for data sharing to become common practice. Roland’s slides can be found here. Jean Liu from Altmetric demonstrated how many different digital communications media can be tracked to assess the reach and impact of scientific publications, counting anything from policy papers to twitter mentions. Jean’s presentation can be downloaded here. Mark Hahnel from Figshare showed researchers can receive credits for all their research outputs by making them available online with Figshare. He also showed how funders are consistently moving towards demanding better sharing and accessibility of research outputs. Download Mark’s presentation here. Open space discussion 2: What are best practices today, what would you recommend your colleagues? Based on the presentations of the day and on the experiences of participants, each group collected their ideas for best practices both short term and long term. Notes from each discussion group are posted on the DNAdigest hackpad. At the end of the day we celebrated our achievements with cheesecake and thanked all our speakers, audience and our sponsor Repositive for a fantastic event. To see more pictures from the Symposium, please go to our online gallery. To view all the social media activity for the Symposium, visit our Symposium Storify page. We would also like to give a big thanks to Mark Hewlett for the awesome photography.